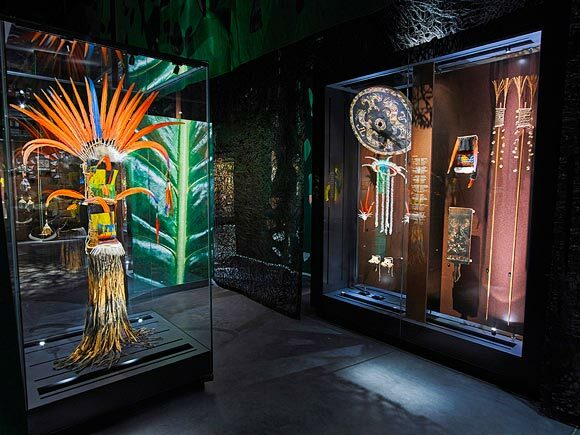 The Large (450 object) and beautifully designed exhibition 'AMAZONIA: The Shaman and the Mind of the Forest', is on until 8 January 2017. The rich MEG collection for the Amazon goes back to the 18th century, includes substantial 19th C collections made by traders, and then many anthropological expeditions from the 1960s onwards. There is lots of historical context, an emphasis on shamanism and hunting, and then detailed displays for ten or more individual cultures, such as the Tukano. There is a great deal of fine featherwork on display, but also barkcloth, psychoactive substances, baskets and other material culture. The exhibition emphasises that these are living peoples, with abundant use of films throughout. Not only is there a lot to see and learn, but there are also 13 subtle & engaging soundscapes throughout the exhibition space, reflecting the Museum's long-standing interest in ethnomusicology. Mark Nesbitt (Research Leader, Economic Botany, Royal Botanic Gardens, Kew). The Mobile Museum project is an ambitious three-year collaboration between the Royal Botanic Gardens, Kew and Royal Holloway, University of London, funded by the Arts and Humanities Research Council. The project traces the global redistribution of ethnobotanical specimens – and thus data about plant uses – via Kew in the 19th and 20thcenturies. As well as addressing major research questions in the history of science, empire and museums, the project will also reconnect thousands of ‘lost’ specimens in museums worldwide with provenance data held in Kew’s archives. The Project Officer will have a vital role in coordinating the wide range of national and institutional contacts required; handling data relating to objects and archives, and coordinating external communications via social media and project workshops. Data management will include the extraction, exchange and standardisation of collections data, creation and maintenance of the project database and image files, and analysis of project results. Support will be given by Kew’s IT specialists and other project staff for technical aspects of data management. The Project Officer will be a core member of the team, alongside two post-doctoral researchers (Dr Caroline Cornish, and another to be appointed 2018), and the two project leaders, Prof. Felix Driver (Department of Geography, Royal Holloway) and Dr Mark Nesbitt (Collections Department, Kew). The post is based at Kew and runs for three years from January 2017. We are looking for applicants with experience of research, to Master’s level or beyond, but are open as to subject area – although situated in the humanities, this is a highly interdisciplinary project. More important is experience of data management and the ability to acquire new skills in this area. The project will have large numbers of contacts and large quantities of data, so good time management and a meticulous approach to data are essential. Good communication skills are required both within the project team and for external audiences. Experience or interest in collections is highly desirable. This post offers the opportunity not only to build deep familiarity with Kew’s world-leading botanical collections and archives, but also to interact with many other museums worldwide. The Project Officer will gain transferable skills in handling a wide range of collection and archive data, and will also be able to develop skills in data analysis applied to historical research. Support will be given for training and career development throughout the project. The closing date is the 16th September 2016. See here for full details and to apply. Proposals for papers are welcome for the two day conference From Malacca to Manchester: Curating Islamic Collections Worldwide, to be held at Manchester Museum on the 23rd and 24th February, 2017. The conference is part of a wider project to catalogue and research collections of Islamic art and material culture across the Manchester Museums and Galleries Partnership (MMGP), and is supported by the John Ellerman Foundation. In the UK there is a need to better understand the rich and complex traditions of the Islamic world. A 2010 YouGov survey commissioned by the Exploring Islam Foundation revealed that the British public know relatively little about Islam and tend to problematise it as a consequence of exposure to negative media stereotypes. In an attempt to counteract this, UK museums and galleries are using collections of Islamic art and material culture to increase understanding and challenge misconceptions. In Manchester specifically, work on the Islamic collections will inform an exciting series of events and exhibitions in 2017 to mark UK-India Year of Culture, and a permanent South Asia gallery due to open at Manchester Museum in 2020. Concurrently, across the UK and Europe high-profile museums such as the Louvre, the British Museum, and the Museum of Islamic Art, Berlin, have embarked upon or completed major re-installations of important Islamic art collections. At the same time, smaller and regional museums are developing new ways to work with existing collections. The role of the curator is changing, and previously underrepresented voices are increasingly given space to express personal responses to material cultures. All such projects represent critical opportunities to present the complexity of Islamic art in innovative new ways, reach out to new audiences and utilise the richness of Islamic material culture to promote social cohesion and understanding. This conference will explore and appraise current and developing practices in the curating of museum collections of Islamic art and material culture around the world, in Europe and in the UK. A keynote address by Dr Stefan Weber, Director of the Museum of Islamic Art in Berlin, will be complemented by a series of presentations, panel discussions, practical workshops, and visits to collections in Manchester including the Whitworth Art Gallery, Manchester Museum, The John Rylands Library (Special Collections), and Manchester Art Gallery. The conference’s aim is to offer a vibrant and challenging perspective on the field, review ongoing projects and public and scholarly engagement, and explore professionals’ aspirations for the future developments of collections of Islamic art and material culture. - Recent and continuing developments in the organisation and display of museum collections of Islamic art and material culture. - The conceptual understanding of these collections (both ‘Islamic’ and ‘art’ as concepts). - The representation of faith in the museum. - Presenting cultural complexity engagingly. - Islam in Europe: in the museum. - How museum education and volunteer programmes are engaging with this field. - Outreach and education involving both Muslim and non-Muslim groups. - Particular challenges faced by non-specialists working with these collections. - Addressing the longstanding scholarly exclusion of certain regions from the traditional consideration of ‘Islamic world’ (i.e. parts of South and South-East Asia). - Migration of artistic techniques and transregional interconnection between cultures. - Approaches to the museum presentation of Islamic artistic traditions alongside those of non-Islamic cultures which are related temporally, geographically, or stylistically. Papers will be 20 minutes in length with an additional 10 minutes for questions. Proposals for presentations or panels of up to four participants should be emailed to Jenny Norton-Wright and Stephen Terence Welsh by 25th September 2016, using the following email address: malaccatomanchester@gmail.com. Proposals should include the presenter’s name, position and institutional affiliation, the paper’s title, an abstract of up to 250 words, a biography of up to 200 words (written in the third person), and a contact email address. Panel proposals should include the above for each speaker, plus a paragraph of up to 250 words describing the panel’s rationale. Informal enquiries in advance of this deadline are welcome. Royal Museums Greenwich has a small but significant World Cultures collection developed from British maritime exploration in the 18th and 19th centuries. Pacific artefacts come predominantly from two famous collecting endeavours: James Cook’s three voyages in the 1760s and 70s, and the activities of the London Missionary Society from the 1790s. Work on a new Pacific gallery for the National Maritime Museum, to open in May 2018, provides the opportunity to revisit these collections, increasing the Museum’s understanding of them, and, through collaboration with Pacific communities, adding much-needed indigenous voices. We invite MEG colleagues to join us for the afternoon examining our collections and sharing expertise. We would particularly welcome assistance from colleagues knowledgeable on tapa cloth and war clubs, in which our collections are particularly strong. Due to restrictions on store access, the visit will be capped at 15. PLEASE EMAIL TONY ECCLES to book your place.